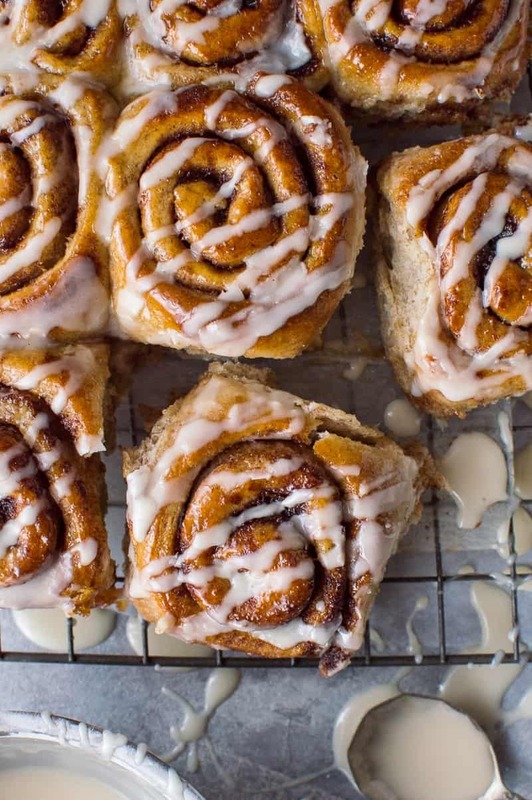 Vegan wholewheat maple cinnamon buns – sinfully good cinnamon rolls flavoured with maple syrup that just so happen to be vegan too! I find baking to be a very relaxing passtime, and though I enjoy all forms of baking, making bread has to be my absolute favourite. There is something very comforting and therapeutic about kneading bread dough, letting it rise, and ending up with warm, freshly baked bread. 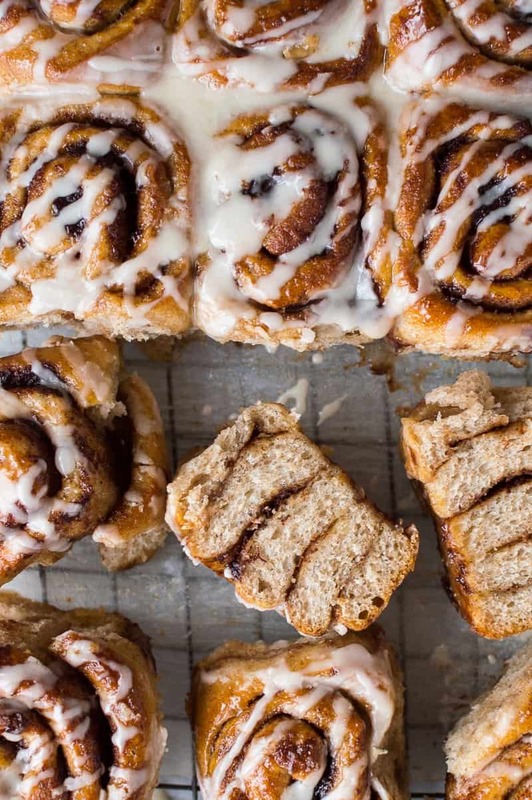 These vegan wholewheat maple cinnamon buns were my latest bread baking experiment and I have to say that they were one of the best things I have ever baked! 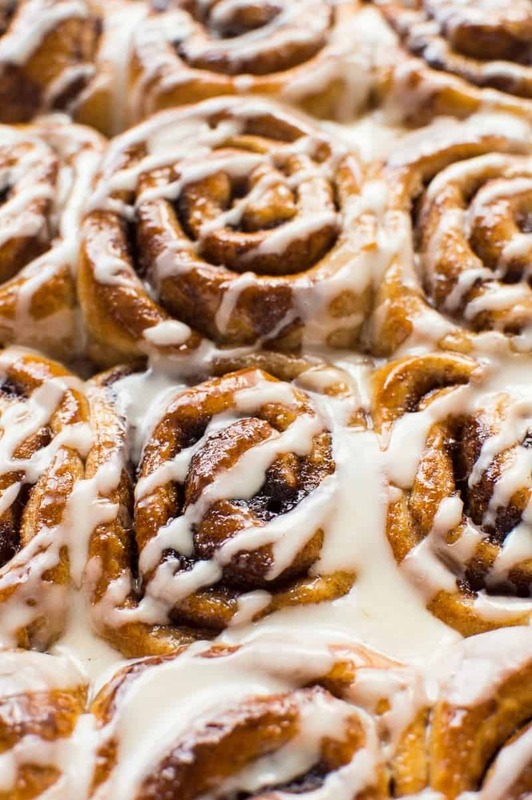 Just because these cinnamon rolls are vegan doesn’t mean that they aren’t as good – my fiance was stunned that they were vegan and said that they were utterly indistinguishable from non-vegan ones, and that they were some of the best, most amazing cinnamon buns he had ever had. So there you go, vegan can be just as indulgent and delicious! I made the dough with half whole-wheat bread flour and half all-purpose; using all wholemeal flour would have made the buns too dense, so going for half is a happy medium – the buns are a bit more wholesome, but still have a wonderful soft, light texture. 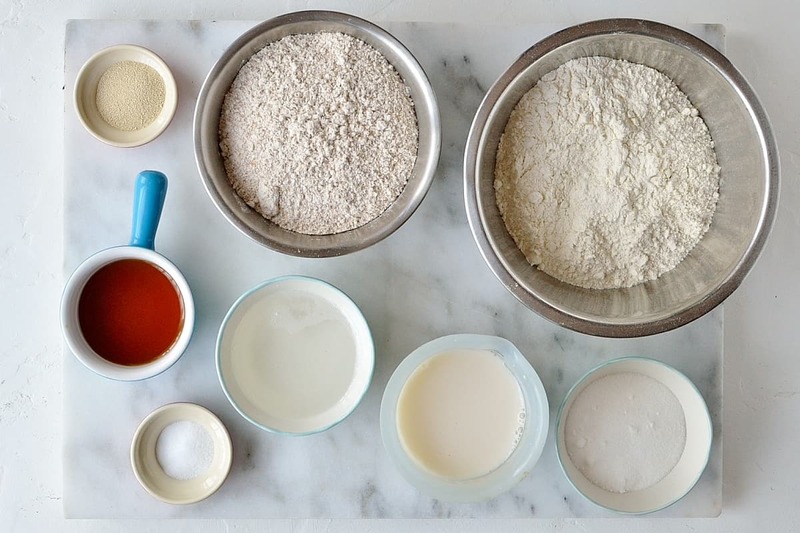 If you want more of a chewy, bread-like texture then you can replace the all-purpose flour with white bread flour instead. The buns are filled with a sweet, sticky mixture of maple syrup, brown sugar and vegan butter (and lots of cinnamon of course). When they came out of the oven I brushed the tops with a little more maple syrup to give them even more maple flavour and a beautiful shine. The buns are finished with a simple maple glaze, you can skip it if you like, they are utterly delicious and sweet enough as they are; but the glaze just takes them into all-out indulgence territory and sometimes that is exactly what you want! 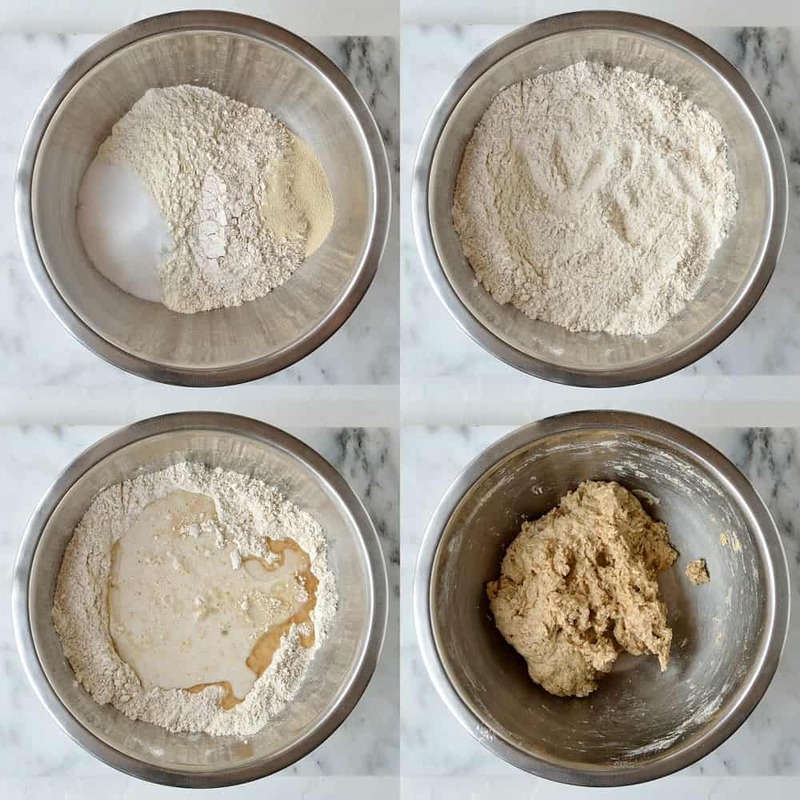 1.Place the all-purpose and wholemeal bread flour into a large bowl; add the yeast to one side and the sugar and salt to the other. Give it a stir then add the maple syrup, coconut oil and almond milk. 2.Mix until it forms a rough dough then either place it in a stand mixer fitted with a dough hook and let the machine knead it until it becomes smooth and elastic and begins to pull away from the sides cleanly; or turn it out onto an unfloured worksurface and knead by hand for about 10 minutes until it is smooth and elastic. The dough should be quite sticky at first but become less so as you knead. When it is ready it should pass the windowpane test. 3.Shape into a ball and place in a large, lightly oiled bowl. Cover with clingfilm and set aside to rise until doubled in size, about 2 hours. Alternatively, you can place the bowl in the fridge and allow the dough to rise overnight; in which case, allow it to come up to room temperature for half an hour before proceeding with the next step. 4.Once the dough has risen make the filling. 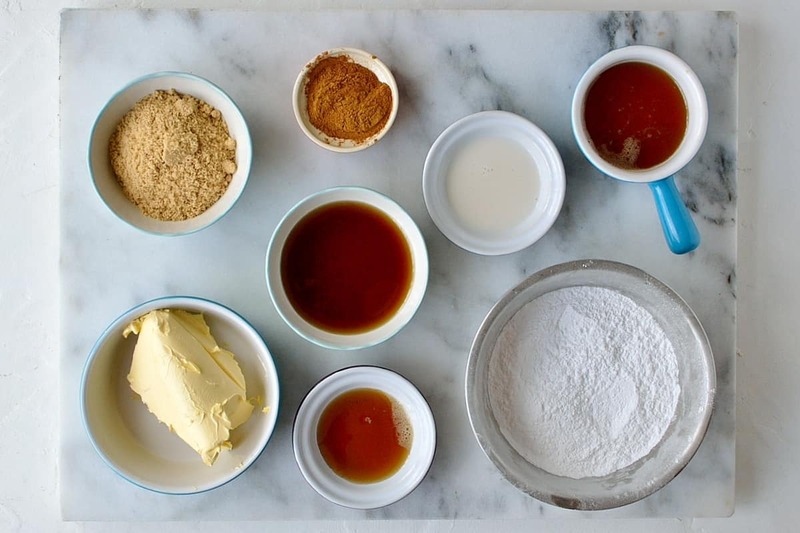 Place the vegan butter, maple syrup, brown sugar and cinnamon in a bowl and beat with an electric mixer until smooth. Don’t worry if it looks a bit curdled. 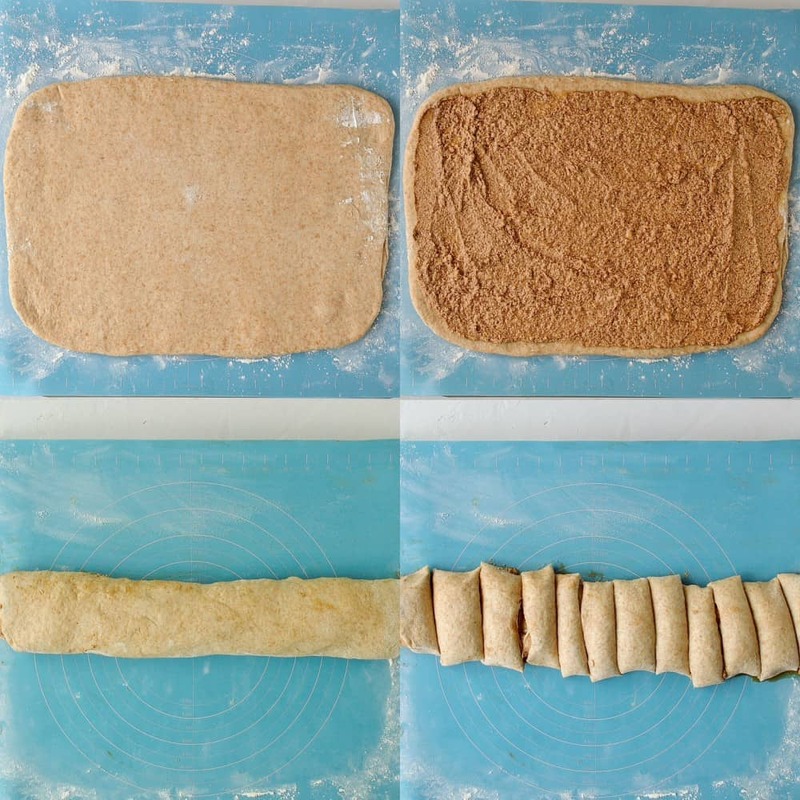 5.Turn the dough out onto a lightly floured surface and roll it out into a rectangle about 8x16inches. Spread the filling evenly all over the dough then roll it up tightly from one of the long sides. Cut the log into 12 even pieces. 6.Line the base of an approx 8×12 inch rectangular tin with baking parchment. Arrange the buns well spaced apart in the tray. Loosely cover with oiled clingfilm and set aside to rise for about an hour until puffy. 7.While the buns are rising preheat the oven to 350°F. Bake the buns for 25-30 minutes, until golden brown and the internal temperature reaches 212°F on a probe thermometer. 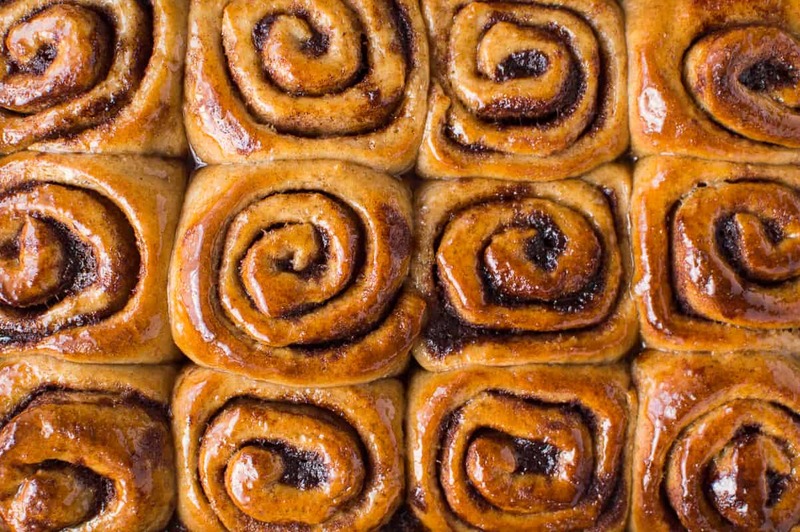 8.Brush the tops of the buns with the 1 ½ Tbsp maple syrup while they are still hot then set aside to cool in the pan. 9.Once the buns have cooled make the glaze (if using). Sift the powdered sugar into a bowl and gradually stir in the maple syrup and almond milk until smooth. Drizzle the glaze over the top of the buns and serve. Best eaten on the day they are made.